Can North & South Magazine Be Salvaged? I was surprised to see an advertisement for North and South magazine in the latest issue of Hallowed Ground that included a special discount to new subscribers. Keith Poulter has a brand new website up, which suggests that he is trying to bring back to life what was once a first-rate publication. Unfortunately, those days have long passed. It is true that when the magazine hit the newsstands back in 1997, it set a new standard for what a popular history publication could be. It regularly attracted some of the top scholars in the field and introduced aspects of the war that had never made it into a popular magazine format. Looking back it is clear that the most important asset on Poulter’s staff was Terry Johnston and he has just launched The Civil War Monitor, which I strongly encourage you to consider. My N&S subscription recently expired and I have no intention of renewing it, not simply because of the way I was handled as an author, but more importantly because of the declining quality of the content. Perhaps I am being unnecessarily critical, but in this economy consumers deserve information with which to base a decision and I am certainly not the first person to raise concerns. For me it was an investment that went sour and that alone deserves to be made known. I am very happy with The Civil War Monitor and as an author and reader I couldn’t be more pleased with Civil War Times. We shall see whether Poulter can salvage his magazine. 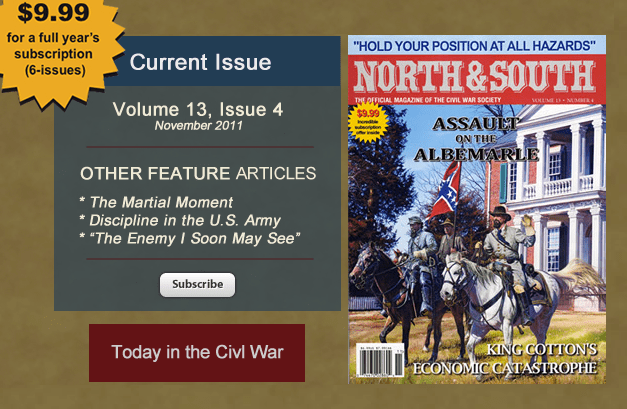 I’ve never had a subscription to North and South, but I’m thinking of spending the $10 on an annual subscription. It’s dinner money and makes it worth it, I think. What are some of the quality control issues you have with the magazine? Like I said, I think the quality of the articles has suffered over the past two years. It’s definitely a good deal. One reason that the qualtiy has suffered might be the unethical treatment of some contributing authors by the British accented editor! Which authors have been subjected to “unethical treatment?” And does the editor’s British accent really matter? I had a horrible experience with the magazine. I’ve told my story before, but basically I was told that an article I submitted had been accepted. It was even advertised as forthcoming in one of the magazines. It never appeared and I was never notified. That answers my questions. Thanks much. Mr. Stoudt, I have also been “treated badly” by Keith Poulter. The British editor also has a habit of not paying authors, and also of running businesses into the ground, to the detriment of his investors. Thanks also for your reply. I did not know the backstory to this situation. No offense intended if my previous questions sounded impolite. The question is not CAN it be saved, but rather, SHOULD it be saved. With the present management, even if it survives now, there is little doubt that it will fail soon. My humble opinion is that the thing is a zombie and needs to be put out of its (and our) collective misery. Given the history I can definitely appreciate the framing of this as a normative question. As long as Keith Poulter is in charge there will be legitimate questions about the operation. Next post: What Did You Read This Year?